AURIN has been holding face-to-face workshops to skill users in the AURIN Portal, at conferences, un-conferences, symposiums and other events. 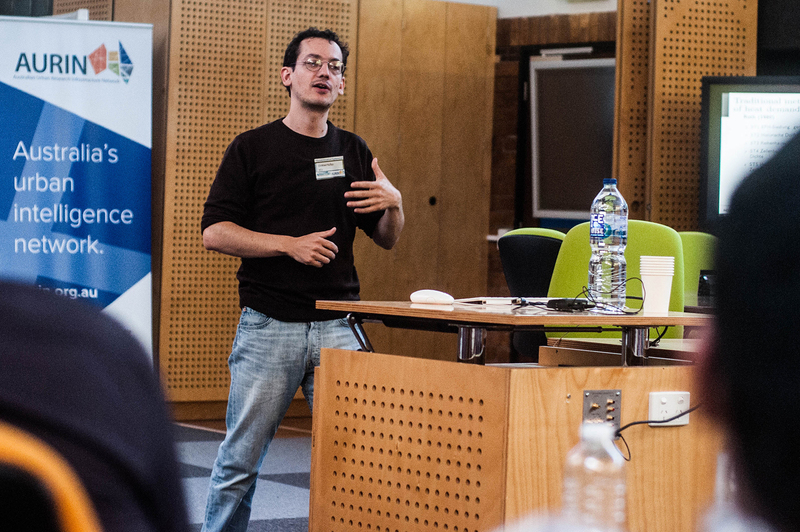 On December 4th and 5th AURIN and NATSEM ran the inaugural MicroSimulation Symposium at the University of Melbourne. From NATSEM, Robert Tanton presented on small area data calculations, demographic modelling with SpatialMSM as well as running a SpatialMSM tutorial and Ben Phillips presented the exciting new HouseMod tool. Our International presenters delivered excellent presentations, including Esteban Muñoz on Modelling heat consumption in Germany and Spatial Microsimulation: an Example with German Data, Ben Anderson presented Electricity consumption using spatial microsimulation and Robin Lovelace presented ‘Real-time’ resilience indicators for Australian cities and facilitated a tutorial on Big Data in R.
In late October we held a Using MapTables in GeoDesign workshop at the University Of Melbourne. 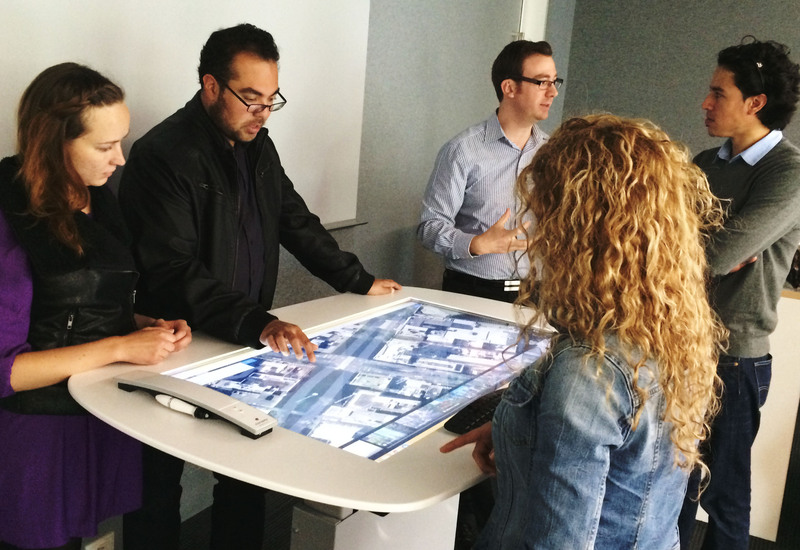 A MapTable® is a large touch table, which allows users to interact with planning tools. This workshop was facilitated by Dr Chris Pettit, and presented by Dr Gustavo Arciniegas Lopez, an advisor on GIS who specialises in developing, testing and implementing MapTable®-based tools and Planning Support Systems (PSS). Case studies were used to demonstrate how the MapTable® could be applied in a number of planning contexts. These included how it could be used as a Geodesign tool for negotiating spatial development rights in a transport corridor connecting Dutch cities, and the sea-use allocation process for a coastal area in Scotland, amongst others. 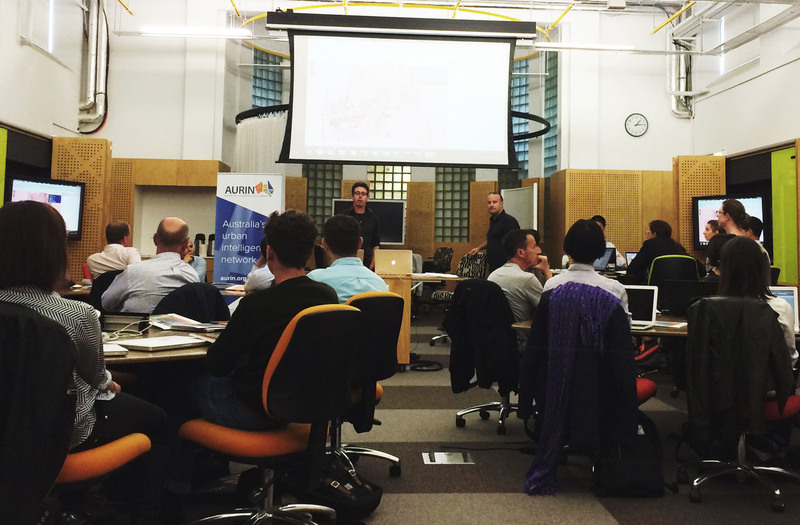 AURIN participated in the inaugural Melbourne TransportCamp Un-conference, as part of Melbourne Knowledge Week. What is an un-conference, you ask? It is designed to be a non-hierarchical system in which the day’s agenda is set by the attendees, who are given the opportunity to run the sessions themselves – they might workshop an idea, find other collaborators for a new project, present some visualised data or simply discuss how the public and innovation sectors can work more closely together. AURIN ran a session presenting an overview of our transport-specific features including including public transport networks, bicycle counters and our very popular walkability tools with a view to building an evidence base to support urban-transport decisions. The sold out Melbourne Masterclass completes our circuit of all the major Australian cities. These day-long sessions have proven to improve participants’ ability to use the AURIN portal, through interactive exercises on their own laptops. Dr Jack Barton and Xavier Goldie guided participants through the urban information landscape with the help of spatial statistical and visual analysis routines. Those present also workshopped their own urban methods and projects, and were shown how AURIN can assist through the provision of data, analysis and visualisation. Our workshops are successful in helping people become more confident using the AURIN portal. As part of Melbourne Knowledge Week, we held an Urban Research Workshop in which participants explored data about Melbourne’s suburbs and Australia’s cities. Using the portal tools, information was extracted for moulding into visualisations and sharable knowledge. AURIN enables access to data that was once behind closed doors. Now, built environment professionals are able to discover and mash-up data, information and knowledge. On the day, exercises were used to engage users in health data, visualising the walkability of neighbourhoods and more.